Millions of people the world over suffer from the crippling effects of emotional issues like anxiety and depression. For many people, these emotional problems have a devastating effect on their life and the lives of their families. While there are plenty of pharmaceutical drugs designed to treat anxiety, stress and depression, they tend to be extremely powerful and come along with the risk of serious side effects and dependency. Fortunately for anybody suffering from these conditions, there is a more natural alternative available in the shape of the volatile oils derived from plants. Essential oils may have become more popular in the past few decades but they have been used since biblical times – the baby Jesus was presented with frankincense oil and myrrh at the time of his birth. A number of studies have demonstrated that certain essential oils are extremely effective in elevating mood and combating emotional issues like anxiety and depression. They are effective because their aromatic molecules can quickly cross through the blood-brain barrier. This means they can have a direct effect on those parts of the brain that control emotional responses like stress, fear, mood and depression. A fairly recent study into the effects of essential oils on depression was conducted on 58 terminal cancer patients in a hospice. 58 patients were treated to a hand massage daily for a week. The massage oil was made up of 3 essential oils – bergamot, lavender and frankincense diluted with a carrier oil (sweet almond). There are a wide variety of essential oils available these days and finding the right oil or combination of oils to suit your personal feelings may take a little bit of trial and error. Certain oils however are well-known for their abilities to treat the mind and boost mood and some have been studied quite extensively. Bergamot is one of the most popular essential oils used in aromatherapy to treat depression and anxiety. It has a distinctive floral flavor that drinkers of Earl Grey would immediately recognize. It is also an excellent remedy for insomnia and to reduce nerves and agitation. Studies done on rats have found that bergamot oil reduces the corticosterone stress response. (2) Other human studies using bergamot in combination with other essential oils have also effectively helped treat depression and anxiety. While bergamot is regarded as safe for inhalation, it can cause photo-sensitivity when applied topically. After application, it is best to avoid exposure to direct sunlight for at least 12 hours. The most popular of all essential oils because of its gentle actions and immense range of therapeutic actions, lavender essential oil is extremely effective in the treatment of emotional problems. As well as anxiety and depression, it is effective in treating insomnia, panic attacks, stress and irritability among many others. Several clinical trials have demonstrated that inhaling lavender oil helps significantly relieve feelings of anxiety and stress. One study which actually used oral lavender capsules found that it was extremely effective. Those treated with lavender experienced far less variations in their heart rate when watching a film designed to increase anxiety compared to the control patients. The conclusion was that lavender essential oil has anxiolytic effects. Ylang ylang oil is another essential oil with calming effects and the ability to elevate mood. It is a popular choice for people hoping to overcome feelings of depression and anxiety. It can also calm the palpitations associated with anxiety and has mild sedative effects that may help with sleep issues like insomnia. A Korean study published in 2006 found that a combination of ylang ylang oil with lavender and bergamot oil helped reduce blood pressure as well as stress response and human cortisol levels. (6) In the study, patients inhaled the combination of oils twice a day for a period of 4 weeks. Vetiver essential oil is commonly used in aromatherapy because of its grounding, tranquilizing effects. It can help reduce feelings of nervousness and anxiety and is considered very helpful for people going through a panic attack or shock. I am sure you are all familiar with the calming effects of chamomile tea it is one of the most popular herbal remedies for feelings of stress, anxiety and insomnia. The essential oil of chamomile is even more effective. It has a rich, calming fragrance that can help improve tranquility and alleviate nerves. Frankincense essential oil is an extremely popular remedy for anxiety as well as depression. Inhaling this wonderful oil helps calm the nerves and boost the mood. It is also used by aromatherapists to help with spirituality and meditation. Rose oil is an extremely popular remedy for feelings of anxiety, stress and depression. It is also effective in calming down panic attacks and can help with shock and the grieving process. An Iranian study into the effectiveness of rose oil was done on a group of women who were pregnant with their fist child. With a little trial and error, you should hopefully hit upon the best individual oil or combination of oils to suit your needs, improve your mood and calm your nerves. The list above contains the most popular essential oils for the purpose but is not finite. Other essential oils that may help include sandalwood essential oil, basil essential oil and geranium essential oil. Because of the controversy regarding the internal use of essential oils, we will look at two other great ways to use your oils. Inhaling your oils triggers a very powerful emotional response. A person’s sense of smell is associated with emotional well-being, memory and mood. When you inhale your essential oils, the tiny molecules enter the nose which stimulates a mental response in the brain. These responses help to regulate stress responses like heart rate, blood pressure and breathing. There are several ways of inhaling your essential oils. You can either directly inhale from the bottle, add them to the bath or use a diffuser or vaporizer. You can apply the vast majority of essential oils to the body in the form of a massage or simply rub them gently into your temples when you are feeling stressed. Because they are so powerful, it is important to dilute your essential oils sufficiently by mixing them with a suitable carrier oil. Coconut oil, almond oil and jojoba all make great base oils. 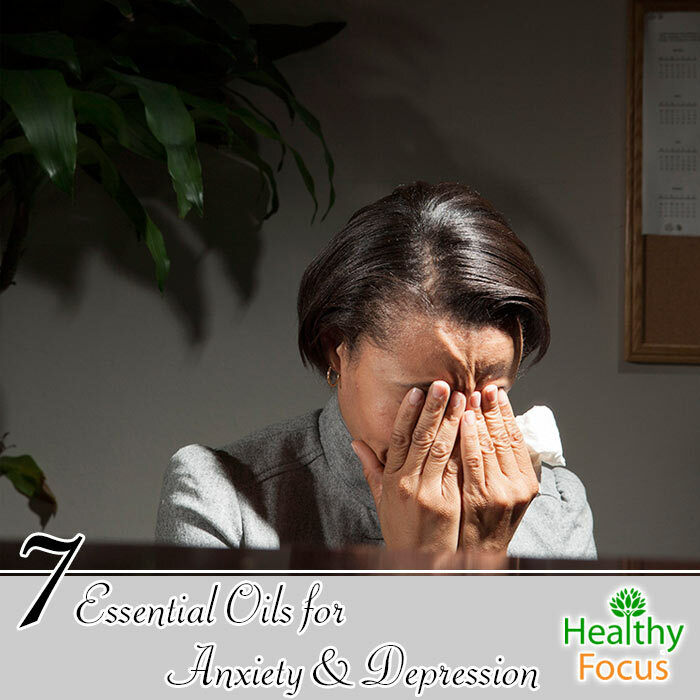 Have you ever tried using essential oils to treat stress, anxiety or depression? If you have please let us know which oil worked best for you. Maybe it is one of the oils mentioned in our list or maybe you can recommend another essential oil to us. We would love to hear from you.